For all vegans and vegetarians, here’s some good news about Americans opting out of eating turkey on Thanksgiving, and choosing non-meat alternatives. According to an article by Laura L. Thornton, in the November 21, 2012 Takoma Park Patch, 3 million Tofurky roasts were sold this year. The Tofurky was invented by Seth Tibbott. In 1995 about 500 Tofurky Roasts were sold by natural food stores in the Pacific northwest. Consumption of Tofurky is on the rise. Turtle Island Foods, located in Hood River, Oregon manufactures meat-like textured Tofurky made from organic tofu, vital wheat gluten, and expeller-pressed, non GMO canola oil. 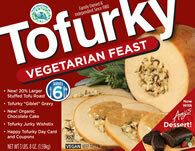 Just click the links in this article to learn more about Tofurky, and where you can buy it. Posted on November 22, 2012, in Food and tagged Tofurky Roasts, Turtle Island Foods, vegan Thanksgiving, Wheat Gluten. Bookmark the permalink. Leave a comment.